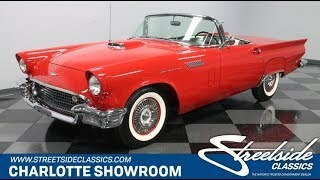 Hi, I am interested in your 1957 Ford Thunderbird (stock #5100-CHA) listed on Autotrader for $71,995. I'd like to get more information about this vehicle and confirm its availability. The 1957 Ford Thunderbird is beloved because its a pure style machine. So when you want to be truly memorable in this rolling icon be sure to find one that has been restored to award-winning standards with fiery red paint... this is that car. This car underwent a full nut-and-bolt restoration in 2012. During that time, the 1957-correct Flame Red was applied. You can tell there was true care and ton invested in just the paint, because of the radiant luster it gives off. And because they made sure the bodywork was straight before laying down the red, this one has the kind of crisp look thats ready to take home trophies. Thats why it won the AACA Senior Award in 2015. That means a car with superior quality, which is why the fender skirts line up nicely and the doors shut with confidence. The restored brightwork really stands out on the smooth front bumper, well-integrated grille, sporty hood scoop, and the intricate rear end with integrated exhaust. Plus, we love how the factory wheel covers add to the shine while offering a hint of the color-matched red steelies beneath. And not only does this have terrific whitewalls, but also they coordinate nicely with the iconic porthole hardtop when its in place. The interior also received plenty of investment during restoration, and the evidence is as clear as black and white. The factory-correct two-tone looks great as the black is used for smooth areas like the seats, steering wheel, carpeting, and upper door panels that flow right onto the dash. The white is used for great-looking texture everywhere from the tuck and roll style inserts in the seats, to the door panels with Thunderbird logos embossed in them. Everything has the great period-correct feeling from the trunk mat to the machine turned panels on the dash. This is a comfortable personal cruiser, and so Ford offered the best options of the time, including power windows. But by 57, this was also meant to be a Corvette rival. Thats why you have sporty details like the floor shifter and full gauge panel, including factory tach. Another nice performance touch is the larger D-code Thunderbird Special 312 cubic-inch V8 this car received in 57. This has all the right indicators to be the original motor, and you can tell they really spent time making sure it was as award-worthy as the rest of the car. The bold red paint on the block, glossy black components, and correct Thunderbird logo valve covers make people take notice. Plus, even the details are right, like the washer fluid bag and the diaphragm around the front of the polished pie dish air cleaner. As you look at the undercarriage photos, you see the difference a high-quality restoration makes where the suspension was restored and even the frame was painted. But more than just a great car for the Sunday car shows, this level of quality means its ideal for Sunday drives, too. Thats why you get easy driving features like power steering, Ford-O-Matic three-speed auto transmission, and power brakes. Complete with build receipts and maintenance records, this is a Thunderbird of distinction that was built for someone of distinction. If thats you, call today!